Mongolian yokozuna Kakuryu grabbed a share of the lead Friday at the Summer Grand Sumo Tournament after sekiwake Tochinoshin suffered his first loss. Kakuryu (12-1) dispatched sekiwake Ichinojo (7-6) in Day 13's final bout at Ryogoku Kokugikan, using good technique to overcome a 65-kilogram weight disadvantage against the biggest wrestler in the makuuchi division. The grand champion quickly secured an inside grip with both hands, resisting an attempted lift before driving his towering compatriot to the straw bales. 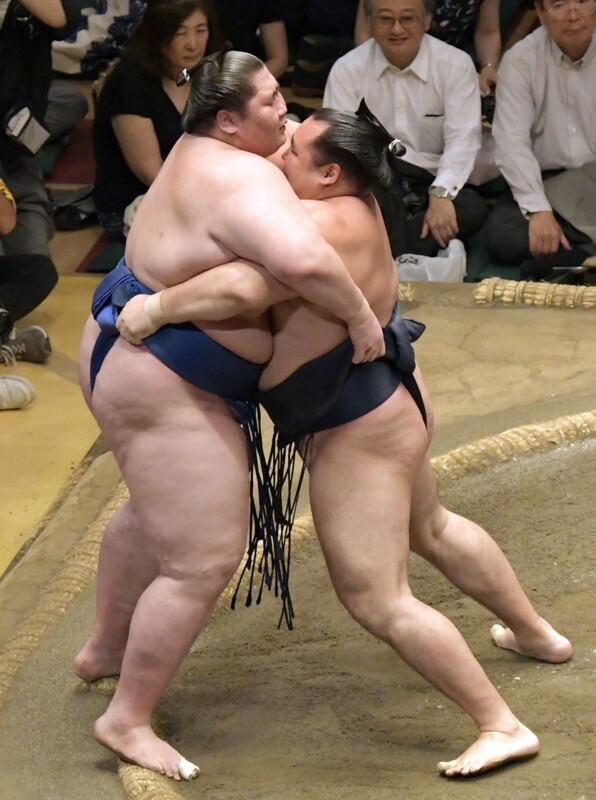 As Ichinojo tried to push back, Kakuryu found the leverage to dislodge the 225-kg, 193-centimeter giant. Tochinoshin (12-1) is all but guaranteed promotion to sumo's second-highest rank of ozeki following his Day 12 win over grand champion Hakuho. But the Georgian once more fell victim to No. 4 maegashira Shodai, who also beat him at the Spring Grand Tournament in Osaka. Tochinoshin slammed into Shodai at the outset, but the maegashira held his ground, driving forward against the powerful sekiwake. Unable to secure a belt grip, Tochinoshin surged forward but appeared to lose his footing, allowing the backpedaling Shodai to pull him down to the clay. For Tochinoshin, the smile he had worn for the tournament's first 12 days was gone after the match. "He got me," the Georgian said. "The first thing I want to do is forget having been defeated." His opponent on Saturday will be Kakuryu. Asked about that bout, Tochinoshin said, "I'll think about it tomorrow." With the victory, Shodai (8-5) secured a winning record with two days remaining in the 15-day tournament. The result also left the door open for all-time championship record-holder Hakuho, who improved to 11-2 with a win over No. 5 Ikioi (8-5). Hakuho drove Ikioi to the edge of the ring before the maegashira fought his way back to the center. As the pair locked up in the middle, Hakuho patiently set his grip before once again maneuvering his opponent to the edge and upending him with an overarm throw. Komusubi Mitakeumi (8-5) secured a winning record with a victory over No. 5 Kotoshogiku (7-6). After locking up his opponent in the opening exchange, the former sekiwake looked set to execute a quick force-out but was pushed back to the center of the ring before eventually driving the one-time ozeki out. Komosubi Endo (3-8-2) succumbed to a push-out against tenacious No. 2 Shohozan (6-7) to remain winless since returning to the tournament after missing two bouts with a right-arm injury.